The executive functions of the brain include the ability to make judgments, decisions, as well as problem solving. The region of the brain responsible for these executive skills or functions is the prefrontal cortex, which is located in the front of the brain behind the forehead region of the skull. Another function of the prefrontal cortex is the management of working (short-term) memory and the retrieval of long-term memories from other areas of the brain (National Institute of Mental Health, 2011). Given both the executive abilities of the brain and aspects of memory are both seated in the prefrontal cortex, it makes sense that deficits in executive skills have the potential to effect memory. In order for something to be encoded into memory, a person needs to attend to the experience at some level. Most people have experienced daydreaming during a conversation or a lecture and later finding they have no memory of the information conveyed while they were distracted. Thus, a person who has difficulty focusing and attending, which are executive abilities, also exhibits deficits in memory since the person's brain never encoded the information into memory. Many times people make judgments about situations without even being aware they are doing so. This is particularly true when a person has a traumatic experience. The human mind might determine that a particular event elicited so much fear that the event is not encoded into memory. This process manifests as amnesia. People might be aware of a particular piece of information but judge it as trivial, thus the information is not encoded into long-term memory. Those individuals who have deficits in judgment are likely to have issues with memory due to problems with the ability to discriminate among relevant and irrelevant information. In order to solve problems, a person must be able to hold and manipulate the information in short term memory. 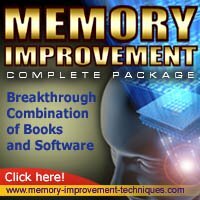 Based on whether the solution to the problem is successful or not, the information used to solve the problem, as well as the solution, is encoded into long-term memory. If a person is unable to discern whether a problem solving strategy arrives at the correct solution, memory deficits might result. One of the executive skills of the brain is to retrieve long-term memories. Faulty (or non-existent) retrieval strategies employed by the executive abilities in the prefrontal cortex result in impairment in recall of facts, words and procedural information (F.L. Coolidge & Wynn, T, 2005). F.L. Coolidge & Wynn, T. (2005). Working Memory, Its Executive Functions, and the Emergence of Modern Thinking. Cambridge Archeological Journal, 5-26.